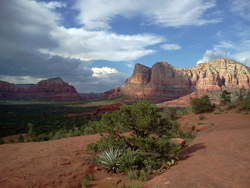 This post is part of a series consisting of excerpts from a journal I keep reflecting on loss, healing, change, and other adventures, usually during the few summer weeks I spend in Sedona, AZ. Links to the LEAD POST and to Emmanuel House—an organization founded by Rick and Desiree Guzman as a living memorial to Bryan Emmanuel Guzman (1985-2006)—are at the bottom of this page. I met a man coming back down the trail. “How far?” I asked. “At least a half mile before you can start going up.” I walked faster. I passed a lone hiker. “When did they close off the small parking space at the foot of the mountain?” “I don’t know,” he said. “It’s my first time here. The mountain’s like a man standing straight up in front of me!” He seemed empty handed, and I hoped he didn’t intend to spend too much time on the mountain because only someone who knew the mountain by heart could get down without a flashlight if they started up as late as we were starting up. By the time I reached Bryan’s tree it was deep dusk. “Hi, Bry, sweetheart, I’m back,” I said. I wanted to send this text message to Linda, Daniel, Josh, Rick & Desiree, Aaron & Kari, Mike & Shannon, Karen & Katie: “I’m back on Bryan’s Mountain, where I shall return almost all the days I’m in Sedona. I love you all. Please take care of yourselves.” I had worked out these simple words earlier that morning, still 400 miles away, but now I couldn’t figure out how to send that message to all those people at once. I fumbled with the phone, finally giving up and sending it to just Linda and Daniel, whose numbers I knew by heart, and asking them to forward it. When I turned back to Bryan’s tree it was dark. Minutes later it was almost pitch black. The stars, thick and bright, seemed to burn just inches from my face. “I got to get going, Bry, I’ll see you tomorrow,” I whispered, thrown off not just by the beauty, but the growing realization that the stars burned so bright because there was no moon, and I could barely see five feet in front of me. Luckily, I had a small flashlight I had just bought for a dollar and had ripped out of its plastic package just as I had left the car. By its tiny light I made my way slowly down the mountain. “Take it easy. Take it easy,” I said over and over. But several times I thought I was lost, and maybe I should call for help. “Keep moving down. Try to find the rock pile markers. Take it easy.” But I found none of those large rock pile markers, and I simmered just below a panic. Finally, about five feet ahead, I saw a low fence marking the trail around the base of the mountain. Now it was even darker. Now the mountain seemed to block out the entire sky, and I had a long way to go. Would the cheap batteries hold out? After 20 minutes I began to fear I had missed a turn or made a wrong one and was on the trail not back to the plaza and my car, but into the wilderness around Court House Rock, another massive rock mountain just to the east of Bell Rock. Earlier on my way up, when the light was still good, I could easily see the fork in the road, left to Bell Rock, right to Court House Rock, but I could hardly see my hand in front of my face now. I thought in reverse, “Keep bearing right. You should be all right if you keep bearing right.” Ten minutes later, straining to see anything off to my right, I saw the merest suggestion of a man-made form against the blackness. The roofline of the small plaza shelter, I thought, and breathed deep. This morning they flag me away from even the main plaza parking, so I head further up the new road until I see a place where you can turn left, cross over the old road and get into a parking lot a little farther from the foot of Bell Rock. It was from this lot Linda, Aaron, Kari and I set off to visit Bryan’s tree last summer. Kari’s wheel chair could only make it up to a large flat space on the mountain’s first tier, so Linda stayed with her there while Aaron and I climbed up to the tree, Aaron snapping pictures all the way, and both of us turning to wave to the girls every few yards. I was more scared coming down the mountain in the pitch black this August 1st, but taking Kari down the trail back to the parking lot in almost pitch blackness was much harder, our way over the bumpy, gnarled ground lit only by Aaron’s cell phone. It took us 45 minutes to go maybe 300 yards, but we were together then and never thought of calling for help. I spend more time than I’ve ever spent sitting by Bryan’s tree. Annoying little flies buzz, and I look way down the mountain to my car far off in the lot below. “Remember how you borrowed that car to visit Katie at Western Illinois, Bry, and how you ran out of gas and screwed up my gas cap? You know that car don’t you? You drove it and rode in it, and it brought me to you this time.” Soon I hear young voices behind me. It’s a mom, dad, and two girls come to giggle and take pictures. “Hey, Dad, take a picture of us up here, up here!” they shout before picking their way merrily up the mountain. To my right and back many yards I suddenly notice a girl sitting, lotus-posed, meditating. In a few minutes she gets up and passes close behind me headed down the mountain. “Good morning she says in a resonant voice. She’s Black and her hair is gathered in large knobs on her head. I think they’re tinted green. As I get up to leave I see a person sleeping way across the rock flat to my right, and there’s another woman poised, lotus-like, on a rock looking towards the mountains that form the prettiest backdrop to Bryan’s tree. She says a peaceful “Good morning” as I pass her on my way down, but the sleeper in the distance is still out cold. Descending the mountain I think of Aaron and Kari again. “It’s not a sad place,” Aaron had said. No, it’s not. There are a couple of signs along the trail that say, “Healing in Progress. Please stay on trail.” Today I spoke to Bry only once, when I was leaving. I told him I’d see him tomorrow. I think I’ll always talk to him up there, so I don’t know why recently it seems important not to do so as much. This ends Part 1 of excerpts I wrote in my journal “Climbing Bryan’s Mountain” in 2008. Read Part 2 of these excerpts. In 2016 Emmanuel House was named one of the “Top 100” social change organizations in the world. This entry was posted in Family and tagged Bell Rock, Bryan E. Guzman, climbing mountains as symbol of spiritual quest, Emmanuel House, Sedona. Bookmark the permalink.